Fall fishing is typically some of the best fishing of the entire season. Fish start to bulk up with egg mass and the late open water time-period is a coveted season for many anglers looking to target trophy class fish. The productive patterns can vary from fishery to fishery but there is a surprising amount of similarities across the board when comparing different big fish locations and patterns across several fisheries. There are several prominent patterns that set up during the fall. What seems to push most patterns into gear are cooling water temperatures. There doesn’t always seem to be a magic surface temperature but more so a trend. The trends often dictate the strategy. Cooling trends solidify the traditional patterns and locations. Warming trends in fall seem to scatter fish. This is an important scope to consider which will be discussed in more detail later. 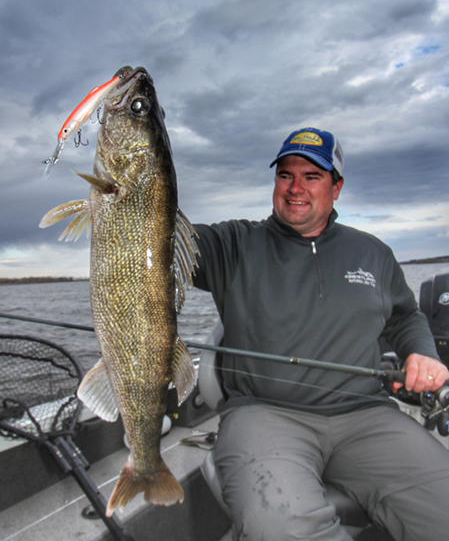 Productive fall locations for big walleye can be both deep and shallow. Prominent main-lake structure that features quick access to deep water is a classic fall location. Steep structure that has a hard bottom is textbook. Large round boulders are often big fish magnets. Another classic fall location is current. Current that is created by a causeway or slot between a couple of islands or perhaps a feeder creek or bridge will often be a perennial fall location for catching big fish. Current in conjunction with rock or boulders can often be magical, particularly after dark during full moon phases. Shallow locations can run the gamut but weeds like cabbage, wild rice or milfoil can hold a surprising number of big walleyes during the fall until the weeds break down and die. The allure of weeds in the fall is that they provide a consistent and stable environment for fish as everything else in the aquatic world changes quite rapidly. Weeds also seem to hold in or retain some heat as the water temperatures cool. These shallow weed bites get better when water temperatures cool after the first major frost but what is interesting is that these shallow patterns often mimic shallow water spring time patterns in that the afternoon often produces some of the best fishing when the sun warms up the water a touch. Other shallow water locations include rock reefs and current locations that in many cases are after dark locations. Shallow current for example has long provided some exceptional after dark chest wading opportunities for catching giant walleye on many fisheries. 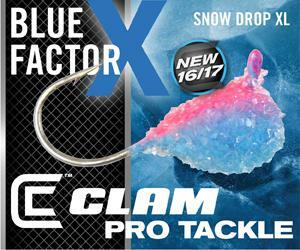 Typically, the after dark fishing peaks with each consecutive full moon cycle. The author Jason Mitchell with a trophy walleye caught trolling the new Salmo Free Diver. This crankbait trolls past thirty feet of water on braided line and is an excellent lure for fall trolling patterns over deep structure. 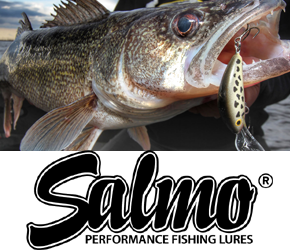 The patterns highlighted above are just classic programs that produce some of the biggest walleyes each season for many anglers across the Midwest. These classic fall patterns seem to set up when the water temps begin cooling. The bite often intensifies when the water temperature each morning is consecutively cooler. The worst thing that can happen to fall bites is a warming trend. When an unseasonably warm spell reverses the cooling trend to the point where the water begins to warm back up, this trend seems to unravel traditional locations and patterns. We often joke that the pattern at this point is that there is no pattern. We typically will find fish scattered with no consistency. Knowing what to do during cooling trends over classic patterns is easy. Making the right decisions on when fish scatter is much more difficult. When the water is cooling, you can focus on a spot or location. When the water warms during the fall, you need to focus on a process. The process of covering as much water as possible and fishing through a milk run of good locations knowing you will find fish scattered. When faced with warming trends and scattered fish, many fish will be transitioning and trolling crankbaits can be a great way to target these fish. When fish transition and travel between point A, and point B, they typically take the shortest and easiest route. What this means is that primary main lake contours and the old river channel on reservoirs essentially become underwater highways for traveling fish. Cover water over big locations. For specifically targeting big fish, bigger profiles typically catch bigger fish. Don’t be afraid to double the length and profile from what you would typically use the rest of the year. When faced with transitioning and scattered fish, don’t get hung up on an icon or waypoint as in thinking that you troll until you find the fish and then assume that you will catch more fish from the same location. Instead focus on your fish per hour. On a tough bite, I am happy with a bite an hour. Two bites an hour would be considered good in some cases. Anticipate a grind where you simply put in the time over a general location and pick fish off one at a time. Because fish are scattered, you need to get in the groove where you are probable that you contact so many fish per hour by traveling a set distance. Remember as well that scattered fish often have a much more difficult temperament in that these fish are not competing with other fish and in some cases, are stressed from the distances traveled. This is exactly why I love to troll crankbaits in the fall when dealing with tough conditions. Not only do I cover water and contact more fish, I can also do a better job of getting a reaction strike by using speed to trigger fish. This fall season, catch some of the biggest walleye of the year by matching up your fishing strategies to the general cooling or warming trends happening on the water. Don’t watch the calendar, watch the temperature gauge.